The depressed new home market is providing a challenge - and an opportunity - for home builders considering entering the retrofit market. A version of this article appears in the March/April 2010 issue of Home Energy Magazine. 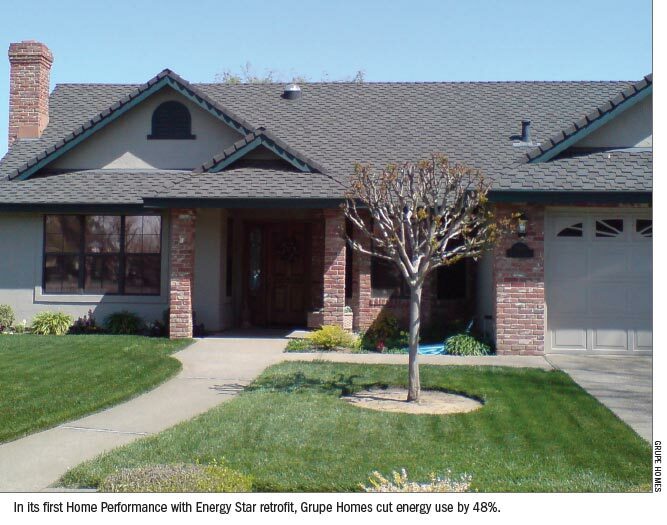 In July 2009, Green Home Solutions by Grupe Homes completed its first Home Performance with Energy Star whole-house retrofit. Grupe achieved whole-house energy savings of 48% compared to the preretrofit energy usage in the 20-year-old, three-bedroom ranch home, located in California’s Central Valley. The home marks the first foray into the retrofit market for the award-winning Sacramento area production builder, who was building 300–400 homes a year prior to 2007. “We see retrofitting as a whole new market for us, and we are excited about the potential,” says Mark Fischer, a senior vice president at Grupe. Fischer heard about Home Performance with Energy Star at the 2008 Energy and Environmental Building Association (EEBA) national conference in Phoenix, Arizona, in September 2008. “After the conference, I started reading about it, and by January of 2009, we decided we were going to try it,” says Fischer. Home Performance with Energy Star, a national program from EPA and DOE, promotes a comprehensive, whole-house approach to making energy efficiency improvements (see “Home Performance with Energy Star”). The program is available in cities where a local sponsor (typically a utility company, state agency, or local association promoting energy efficiency) has agreed to partner with Energy Star. The local sponsor recruits home improvement contractors and trains them to perform comprehensive home assessments and best-practice improvements based on whole-house building science. More than half of the over 66 million single-family homes in the United States were constructed before modern energy codes existed. Many of these homes have no wall insulation, high levels of air infiltration, inefficient heating and A/C, and inefficient water heaters and appliances. In fact, over 40% of households report at least some winter drafts, and 62% complain of a room that is too warm in the summer, according to Home Performance with Energy Star. By December 2008, more than 50,000 existing homes had been improved through Home Performance with Energy Star programs, 12,000 of them in 2008 alone. There were more than 25 program sponsors and 750 participating contractors, according to Jonathan Passe, EPA communications coordinator for Energy Star Residential Programs. For more information on Home Performance with Energy Star, go to www.energystar.gov/homeperformance. The California Building Perform-ance Contractors Association (CBPCA) is currently the only organization in the state of California providing contractor training for Home Performance with Energy Star. The training is funded by Investor Owned Utilities (IOUs), such as Pacific Gas and Electric Company (PG&E), Southern California Edison, and Sacramento Municipal Utility District, through the public benefit charge, as well as by grants through other government agencies, according to Pat Colburn, director of CBPCA’s Support Services. “Our signature training is called Home Performance with Energy Star. It is a nine-day course divided into three three-day segments or levels. At the end of the third level, our participants can take the written test from the BPI,” says Colburn. All four BPI specialty written tests are offered on the third day of level three. Participants can be certified in one or all of these specialty areas: Building Analyst Professional, Envelope Professional, Heating Professional, and A/C-Heat Pump Professional. Once trained, the participating contractors provide recommendations and services to homeowners to make their homes more comfortable and energy efficient, while reducing their utility bills and protecting the environment. The contractor will evaluate the house as a whole system and will present the home-owner with a comprehensive proposal. The recommendations go far beyond just adding insulation; the list of renovations may include air and duct sealing, HVAC tune-up, utility bill disaggregation, building pressure diagnostics, attic ventilation, crawlspace ventilation, window thermal performance, temperature stratification testing, air conditioner performance factors, lighting efficiency, appliance efficiency, water heater improvements, worst-case combustion tests, indoor air quality, building ventilation, and water vapor transmission and control, depending on the condition of the house and the needs of the homeowner. Unlike typical home energy audit programs, the goal of Home Performance with Energy Star is to turn the recommendations into improved homes. Participating contractors complete the needed renovations or team with other participating contractors who can. Another important element of the home performance approach is that the contractor assesses the home’s performance again after the project is completed in order to verify that improvements were properly installed to achieve the promised energy savings. Finally, all participating contractors are subject to quality assurance reviews by an independent third-party inspector to ensure that projects meet program standards and homeowners receive high-quality work. Verifiers ensure that the contractor has submitted a complete Home Performance Assessment to the homeowner, and that the work was completed to the standards of the BPI. The verifiers are contractors in their own right who have taken Home Performance with Energy Star and additional training and have proven their experience and dedication to Home Performance with Energy Star standards. These verifiers are not given the name of the contractor whose work they inspect, to ensure a truly independent inspection. Grupe’s first retrofit was a 2,129 ft2 home built in 1987 in Lodi, in California’s Central Valley. The homeowners were interested in learning the results of an energy audit because their furnace was old and needed to be replaced, and they thought they were paying a lot in electricity bills. They also complained that the living room supply registers were blowing too strongly in both heating and cooling modes. “Even before we go out to the house, we ask for homeowners’ gas and electric bills for a year to assess how much they are spending to heat and cool their home,” says Fischer. In this case, the electric bill for a year was $5,566 (with a high of $687 in August) and the gas bill was $826 (with a high of $155 in January). The home used on average 1,470 kWh per month, which is high compared to 800 kWh, the average monthly utility bill for a home of its size in California’s Central Valley. Armed with this information, the Grupe team began their on-site assessment. “We follow the Home Performance with Energy Star guidelines. It takes between four and eight hours to do the assessment, and we charge $500 to $1,000, depending on the size of the home,” says Fischer. The homeowner pays this fee and gets it back if the builder does the work. Once the energy audit was complete, the Grupe team prepared a detailed proposal with cost estimates and met with the homeowners to review their findings and recommendations. In this case, the homeowners agreed to all of the recommendations at a total cost of approximately $17,000. The homeowners did investigate federal, state, and local rebates and financial incentives for their Home Performance with Energy Star retrofit. (The Database of State Incentives for Renewables and Efficiency (DSIRE) provides valuable information on this topic.) They received $2,600 in tax credits and rebates, including a federal energy efficiency tax credit of $1,500 and a $750 utility rebate from Lodi Electric Company. The work began with sealing the home. Grupe’s team checked the home for areas that needed air sealing. They found that the damper in the living room fireplace would not close completely, which resulted in significant heating and cooling loss. Because the homeowners did not use the fireplace, Grupe sealed the fireplace with a Chimney Balloon, which must be removed if the fireplace is ever used. The home had R-30 blown-in fiberglass insulation in the attic and R-22 fiberglass batt in the cathedral ceiling over the family room. An assessment showed that settling had occurred; the blown-in fiberglass was not at proper depth to provide R-30, nor were the batts in good contact with the drywall in the cathedral ceiling. Grupe removed the fiberglass, sealed the air gaps, reinstalled the fiberglass, and covered this with blown-in cellulose to provide an R-49 rating. Tests showed 15% leakage in the duct system. The ducts were suspended from the roof framing in the attic (see photo above); they drooped and had kinks in several places that restricted air flow. The Grupe team removed the hanging ductwork and installed new R-8 insulated ducts. The new ducts were sealed with mastic, laid on the trusses, and covered with the blown-in cellulose insulation. The importance of a whole-house approach to retrofitting became apparent in the recommendations for heating and cooling. The original 80,000 Btu furnace was manufactured by Rheem in 1985 and was oversized by a factor of 1.9, as the existing load was 41,763 Btu. The original 4-ton cooling system was manufactured by Bryant in 2000 and was designed for a load of 48,000 Btu; it too was oversized by almost 2 tons, as the existing load was 30,515 Btu. As replacements, the team installed a new Lennox 2.5-ton sealed-combustion, two-stage variable-speed gas furnace/air handler with an efficiency rating (AFUE) of 95%; a new Lennox 2.5-ton, 15.5-SEER/12.5-SEER A/C unit; a Lennox HC-10 filtering system; and a new Lennox ComfortSense 5000 touch screen set-back thermostat. The new furnace and air conditioner are more than adequate to handle the postretrofit heating load of 37,020 Btu and cooling load of 26,029 Btu. In addition to saving money, these properly sized units solved the homeowners’ complaint that the living room supply registers were blowing too strongly. The original double-pane, aluminum-framed windows were in good condition. To save money, these windows were not replaced. Instead, the glass in six of the windows facing west and south was covered with a high-end window film called NV-15. The film, which is made by 3M, reduces solar gain to a solar heat gain coefficient (SHGC) of 0.29. Software calculations showed that this change should reduce the home’s cooling load by 3,500 Btu. Recessed lights, if not properly sealed and insulated, can cause significant air leakage. Grupe replaced 14 recessed can lights with new insulated, airtight (ICAT rated) can lights and caulked at the rim. Because the house is tightly sealed, when Grupe installed the new HVAC system it included a mechanical damper timed to the air handler to bring fresh air into the house for 30 minutes of every hour. 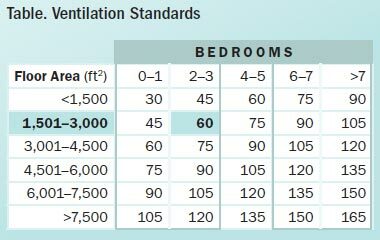 The ventilation system provides continuous ventilation for the home at the recommended air exchange rate of 0.35 ACH. The team replaced an inefficient swimming pool pump with an energy-efficient variable-speed pump for a predicted energy savings of 3,000 watts per day in the winter and 5,000 watts per day in the summer. 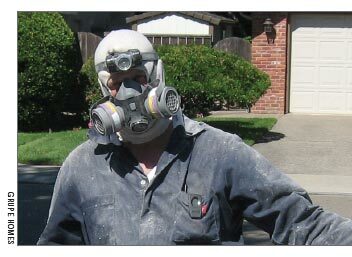 The original Duct Blaster test showed 15% leakage in the ducts. The test with the new system showed 5.1% leakage. The original blower door test showed leakage at 2,478 CFM50, which, Rugani explains, is actually not bad for an old house, as standard air leakage for a house of this size is about 2,257 CFM50. By extensive caulking and sealing, “we took this leakage from 2,478 to 1,150 CFM50, a 55% reduction,” says Rugani. As part of the assessment tests, the team took air flow measurements of 1,143 CFM in cooling mode at each of the registers for the 4-ton system. In the test-out, the 2.5-ton system delivered 1,095 CFM. “We were delivering almost as much air after with a ton and a half less capacity,” says Rugani. When Grupe compared utility billing data for the first four months postretrofit with the same four months from the prior year, it found that the homeowners’ bills were down 53% (see Table 1). Utility costs went from a total of $1,680 for August–November 2008 to $784 for the same months in 2009, a savings of $896. Marye Hefty and Theresa Gilbride are researchers at the Pacific Northwest National Laboratory, where they support Building America for the U.S. Department of Energy. For more information on Building America go to www.buildingamerica.gov. To learn more about rebates and financial incentives check out the Database of State Incentives for Renewables and Efficiency at www.dsireusa.org. This site is a comprehensive source of information on state, local, utility, and federal incentives and policies that promote renewable energy and energy efficiency. The site was established by DOE in 1995 and is maintained for DOE by the North Carolina Solar Center and the Interstate Renewable Energy Council.